A farmer’s field day on pea var. Prakash was organised by Krishi Vigyan Kendra, Ri Bhoi, ICAR, Umiam under the Cluster front line demonstration (CFLD) pulses 2018-19 on 23rd March 2019 at Kyrdem Village Ri Bhoi. 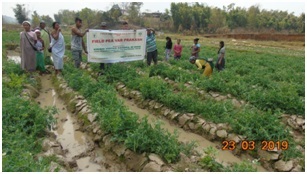 The aim of field day was to showcase the potentiality of growing second crop pea in the rice-pea cropping system for significantly improving the profitability of small and marginal farmers and to bringing together farmers and other stakeholders in the agricultural value chain for building economic motivation on the best crop management practices. 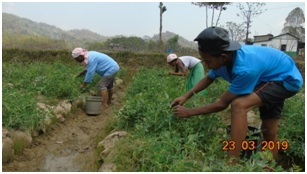 Kyrdem village was chosen as the venue for field day were the cropping system was demonstrated in 1 ha of area by providing both material input and required capacity building programme through KVK, Ri Bhoi as the guiding platform. The field day also provided a forum where farmers could engage policy makers and agricultural experts on the opportunities & challenges they faced during the period. Around 25 farmers of the village and neighbouring villages participated the event which was graced by the headman of the village. The farmers also committed to work closely with the KVK and the local community of nearby villages in promoting the best ways to manage and horizontally spread the successful technique witnessed and experienced by them. 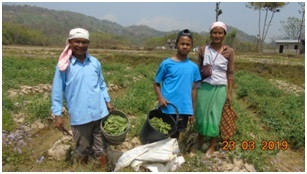 The crop was harvested as vegetable pea and expected get higher yield in terms of seed.